Speaking at the National Defense University in Washington Obama said, “America is at a crossroads. We must define our effort not as a boundless 'global war on terror' - but rather as a series of persistent, targeted efforts to dismantle specific networks of violent extremists that threaten America." “We must define the nature and scope of this struggle, or else it will define us, mindful of James Madison's warning that ‘No nation could preserve its freedom in the midst of continual warfare.’ Neither I, nor any president, can promise the total defeat of terror,” he declared. Appointing a new envoy at the State Department and an official at the Defense Department who will attempt to negotiate transfers of Guantanamo detainees to other countries. Lifting the moratorium he imposed in 2010 on transferring some detainees at Guantanamo to Yemen. Obama imposed that moratorium after it was revealed that Detroit “underwear bomber” Umar Farouq Abdulmuttalab was trained in Yemen. 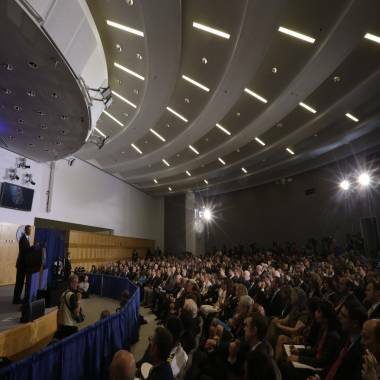 President Barack Obama talks about national security, Thursday, May 23, 2013, at the National Defense University at Fort McNair in Washington. There remains considerable doubt about Obama’s ability to persuade a majority in Congress to change the current law on releasing detainees held there. 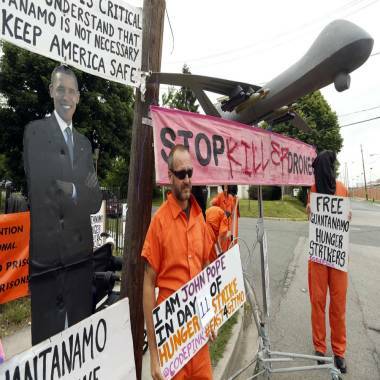 Demonstrators stand near a mock drone at the gates of Fort McNair where President Barack Obama will speak at the National Defense University in Washington May 23, 2013. The defense spending bill which Obama signed into law last year prohibits any transfers to the United States of any detainee at Guantanamo who was held there on or before Jan. 20, 2009, the day Obama became president. And the law sets a very high legal bar for Defense Secretary Chuck Hagel to transfer a detainee to his country of origin or to any other foreign country. Hagel would need to certify to Congress that the detainee will not be transferred to a country that is a designated state sponsor of terrorism. The country must have agreed to take steps to ensure that the detainee cannot take action to threaten the United States, U.S. citizens, or its allies in the future. The law allows Hagel to use waivers in some cases to transfer detainees. In a mostly skeptical and sometimes dismissive reaction to Obama’s speech, key Republican senators said at a press conference that he still had not offered a coherent plan for what to do with the different types of detainees held at Guantanamo, some of whom they said need to be held indefinitely, while others might be eligible for release. Sen. Saxby Chambliss, R- Ga., the vice chairman of the Senate Intelligence Committee, noted that 56 of the Guantanamo detainees are Yemenis and that since 2010 the Yemeni government has “absolutely not” shown any indication that it can prevent released detainees from planning and carrying out terrorist attacks on Americans. “If we were to transfer those individuals to Yemen, it would be just like turning them loose,” Chambliss told reporters. Speaking a day before Obama’s speech, Ben Wittes, senior fellow at the Brookings Institution and co-founder of the Lawfare blog which covers detainee news, said, “I don’t see any significant change in congressional sentiment right now” on closing the Guantanamo site.